is an introduced, invasive species which is increasing its toehold on southern Vancouver Island and is present along many of our roadways and encroaching into fields and meadows. It is most noticeable in August when it sends its brilliant yellow, daisy-like, flat-topped flower heads shooting up to six feet in the air. One multiple stemmed plant can produce 150,000 long-lived seeds per season. The plants contain a toxic alkaloid that can poison livestock by causing cumulative liver damage, particularly in cattle, pigs, horses and deer. Tansy ragwort has a shallow, fibrous root system which can easily be pulled by hand but wear gloves and protective clothing whenever you tackle invasive species removal as some people are more susceptible to allergic reactions than others. Giant Hogweed is an invasive plant that is a hazard to public health. Residents should be aware that contact with Giant Hogweed may result in severe skin burns, scarring and blindness. If not controlled, the plant will spread rapidly. The District appreciates the cooperation of residents in removing it from private land. Should you see this plant on the roadside, please call the Municipal Hall. Knotweed is a vigorous, invasive plant recently introduced to the Capital Region. If not controlled in its early stages, it will destroy natural habitats. It has been known to grow through building foundations and pavement. There have been two occurrences reported within the District of Metchosin. If not controlled, the plant will spread rapidly. 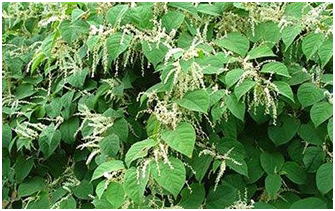 The District appreciates the cooperation of residents in eradicating Japanese Knotweed. Should you see this plant on public land, please call the Municipal Hall (250)474-3167. For sightings on private land, there is a special treatment program available to property owners through the Capital Region Invasive Species Partnership (250)857-2472. The following link is an article from the Times Colonist.